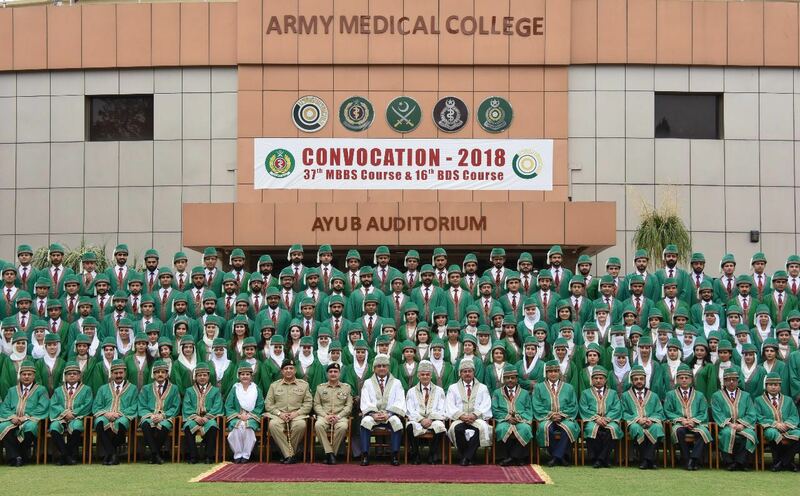 RAWALPINDI: The convocation ceremony of the 37th MBBS and 16th BDS course was held on Friday at Army Medical College, Rawalpindi, where Chief of Army Staff (COAS) General Qamar Javed Bajwa, as the chief guest, awarded degrees and medals to the graduating students. Dr Taymmia Ejaz was awarded President’s Gold Medal for being best all-rounder cadet for 37th MBBS course while Dr Zunera Saeed was awarded President Gold Medal for being best all-rounder cadet for 16th BDS course. Captain Muhammad Shoaib was awarded COAS Gold Medal for being the best military cadet. Speaking on the occasion, COAS Bajwa congratulated the graduating students and their parents and wished the graduating doctors success in their future endeavours. COAS also acknowledged contributions of Army Medical College for their diligence in providing quality education to the students. The ceremony was attended by senior serving and retired military officers, faculty members and parents of the graduating students.